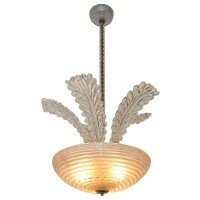 Exceptional 1940s Barovier Italian handblown glass chandelier or hall/entry pendant light. Dish form with five large decorative leaves. Glass dish is ribbed with controlled bubbles and satin finish to interior to provide a more evenly distributed light. Ceiling cap is ribbed glass with controlled bubbles. Twisted glass hollow rod covers a brass center rod. Uses three 40-watt candelabra size bulbs, newly wired. Fixture size largest outer diameter 21″ x 15″ tall, overall with rod and ceiling cap 38″.